I bet you remember the recently done Detroit Motor Show where many car-makes demoed their vehicles and got very good results as well. Now, many cars from the show has arrived at the ongoing Geneva Motor Show and one of them is this Mercedes-Benz CLA Shooting Brake. It is supposed to go on sale in the European market this month and I guess this show is just the right platform to gather potential customers or lure some others in. Well, talking about the car, it has everything that you could expect in a M-Benz vehicles from decent power to comfortable interiors and mesmerizing looks as too. 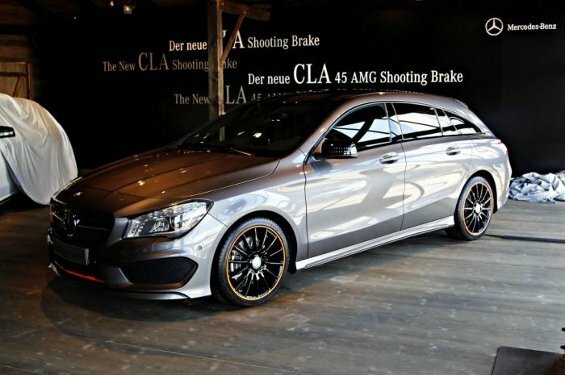 As it's based on the CLA sedan design, the looks are somewhat same, but the dimensions are a bit bigger like 4,360 mm length, 1,777 mm width and 1,435 mm height. However, it could not be defined as the MUV, but Estate would be a good word to define its design. This version also has more luggage space which could be understood by its dimensions of course. Coming to the engine, its has been offered in both diesel and petrol version with 4 -Cylinder. There is this 1.6 Litre turbocharged petrol engine with 2.0 Litre option for higher trims and a 2.2 Litre diesel engines with different power outputs. The price of the car is around Euro 30,000 for petrol and Euros 35,000 for diesel version in Europe which makes it around INR 20 Lac for petrol and INR 23 Lac for diesel, if launched in India.